Scripps Oceanography research vessels Roger Revelle and Sally Ride sit stern-to-stern at dock in Seattle earlier this week as they prepare to head to sea for new scientific cruises. Though based at Scripps's Nimitz Marine Facility in San Diego Harbor, both vessels were in Seattle because they had just finished a joint NASA-led field campaign dubbed EXPORTS (EXport Processes in the Ocean from Remote Sensing). Sally Ride headed to sea to recover and deploy a series of moorings for the Ocean Observatories Initiative's Coastal Endurance Array off the Washington and Oregon coasts. 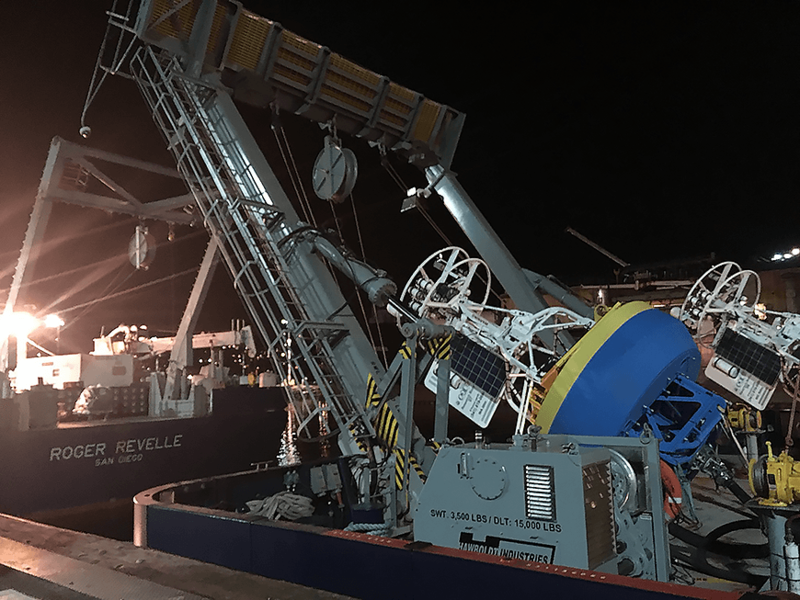 The blue-and-yellow surface buoys stacked on the aft deck will suspend a variety of instruments in the water column and connect to the ocean-bottom network. Roger Revelle sailed north to start a two-month U.S. GEOTRACES GP15 cruise to sample the marine biogeochemical cycles of trace elements and their isotopes from Alaska to Tahiti. Follow Sally Ride on Twitter at twitter.com/RVSallyRide. Follow Roger Revelle on Twitter at twitter.com/RVRogerRevelle.